The twelfth challenge in the #Trust30 Challenge is inspired by Ralph Waldo Emerson's quote - 'I will not hide my tastes or aversions. I will so trust that what is deep is holy, if we follow the truth, it will bring us out safe at last'. Ashley Ambirge poses the challenge - think of a time when you didn't think you were capable of doing something, but then surprised yourself. How will you surprise yourself this week? I didn't think I was capable of going out anywhere without feeling anxious or being sick. Especially somewhere dreadful like my Opa's funeral. I was sick that day though. From coffee. Horrible coffee that after three sugars still needed (approximately) five more sugars and a heap of milk to make it drinkable. I wasn't anxiously sick though. I don't think it means anything about my anxiety. Rather I think it was because I was processing so many other emotions. It still surprised me though. I know that I am overcoming my anxiety, albeit slowly. I think about it less and I'm getting sicker less often. Now I just need to take my medication regularly and stop forgetting. This week I have a BIG week. 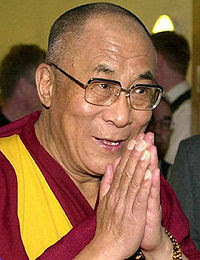 I'm volunteering for the Dalai Lama's Brisbane leg of his Australian tour. Wednesday and Friday. I'm so excited. I'm going to surprise myself by not feeling anxious either days but rather excited! It sounds like you're going to have an amazing few days - i hope you enjoy it!